However, if and lie inside the same conductor then it is clear from Eq. (620) that the potential difference between and is zero. This is true no matter where and are situated inside the conductor, so we conclude that the scalar potential must be uniform inside a conductor. A corollary of this is that the surface of a conductor is an equipotential (i.e., constant) surface. for any closed loop . If there are any electric field-lines inside the cavity then they must run from the positive to the negative surface charges. 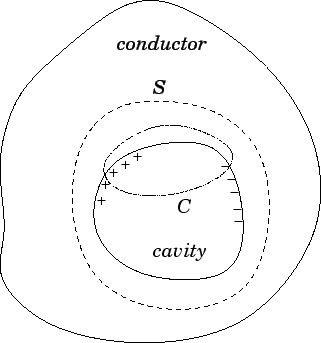 Consider a loop which straddles the cavity and the conductor, such as the one shown in Fig. 41. In the presence of field-lines, it is clear that the line integral of along that portion of the loop which lies inside the cavity is non-zero. However, the line integral of along that portion of the loop which runs through the conducting material is obviously zero (since inside a conductor). Thus, the line integral of the field around the closed loop is non-zero. This, clearly contradicts Eq. (621). In fact, this equation implies that the line integral of the electric field along any path which runs through the cavity, from one point on the interior surface of the conductor to another, is zero. This can only be the case if the electric field itself is zero everywhere inside the cavity. There is one proviso to this argument. The electric field inside a cavity is only zero if the cavity contains no charges. If the cavity contains charges then our argument fails because it is possible to envisage that the line integral of the electric field along many different paths across the cavity could be zero without the fields along these paths necessarily being zero (this argument is somewhat inexact: we shall improve it later on). We have shown that if a cavity is completely enclosed by a conductor then no stationary distribution of charges outside can ever produce any fields inside. So, we can shield a piece of electrical equipment from stray external electric fields by placing it inside a metal can. Using similar arguments to those given above, we can also show that no static distribution of charges inside a closed conductor can ever produce a field outside the conductor. Clearly, shielding works both ways! as the relationship between the normal electric field immediately outside a conductor and the surface charge density. which is in agreement with Eq. (623). This technique for calculating a force given an expression for the energy of a system as a function of some adjustable parameter is called the principle of virtual work, and is very useful. 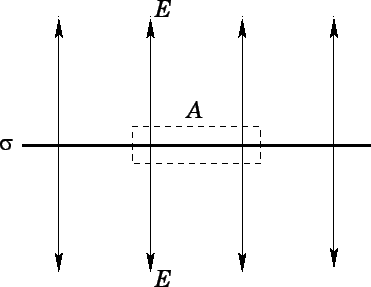 We have seen that an electric field is excluded from the inside of the conductor, but not from the outside, giving rise to a net outward force. We can account for this by saying that the field exerts a negative pressure on the conductor. We know that if we evacuate a metal can then the pressure difference between the inside and the outside eventually causes it to implode. Likewise, if we place the can in a strong electric field then the pressure difference between the inside and the outside will eventually cause it to explode. How big a field do we need before the electrostatic pressure difference is the same as that obtained by evacuating the can? In other words, what field exerts a negative pressure of one atmosphere (i.e., newtons per meter squared) on conductors? The answer is a field of strength volts per meter. Fortunately, this is a rather large field, so there is no danger of your car exploding when you turn on the stereo!